The ability to concentrate has grown in importance in the ever speeding pace of modern society. The feedback cycle of information and matter are getting faster and faster. Moreover, multi-tasking has become a fundamental prerequisite for daily work. Furthermore, quality of services and quantity of serving duration keep increasing. All these factors require our good concentration. Research has been carried out to evaluate different treatments using evidence-based medicine methodologies. One of the treatments is the observation of one’s breath, namely Anapana, and its extension to the observation of the bodily sensations called Vipassana. In this workshop we will practice the mini version of the treatment. From the analysis of the practice, we will try to find the common structure and relationship that can be generalized using systems thinking which could help us understand how our minds work. Research has shown that this systems thinking is rooted from the teaching of Buddha. The application of system theory requires the understanding of ourselves and of each other, the nature, and the past and future possibilities in a systemic way. That is, we need to understand both the structure and dynamics of our physical body systems, and of our mental mind observations. Research shows that the composition of our body and that of our mind may be explained by the same system theory relating to energy, matter, life and information. We employed this simple ancient system theory as taught by Buddha to investigate how our naturally systemic-structured mind arbitrarily developed all the non-systemic and problematic way of thinking. We use our body to experience the world around us but our mind is the one which is observing and making decisions to change the world. System theory sees the world as composing of observers, decision makers, systems, the environment, the boundaries and relationships between them. There are in effect two opposite forces in the world that constantly interact with each other, creating a flow of energy, matter and information between systems and the environment. On one hand we have the disorder force governed by the second law of thermodynamics that drives everything into an equilibrium state with maximum entropy. On the other hand we have the organizational force governed by the constraints of a system that drives the system into a particular desired steady state with a low entropy. Our minds are both the observer and the decision maker confronting a major problem. Throughout our life we look for satisfaction that brings happiness. Our government has been relying on economics to achieve this but 80% of the time we are dissatisfied with the people and situations around us, giving rise to craving, aversion and ignorance in our minds and creating all sorts of problems in our society. This is called suffering in the teaching of Buddha, and he offered us a three step solution for our mind. In this workshop we will investigate the systemic view of these three steps, namely self-protection, concentration and purification of mind. We will also investigate a 10-day Vipassana mental healthcare program for people of all religions including scientific communities. It is believed that such a program could bring happiness, peace and harmony for our society. Is death the end of our lives or just the beginning of another new life? A system undergoes a transition of system state upon death, but will the system continue in other forms at other places? Or will it just terminate totally? What are the possible new system states and are they sustainable? In this workshop we will investigate the sustainability of Heaven, Hell, Earth and Nibbana (null). We will also investigate the way to prepare ourselves to transit into these states. Chicken or egg first 先有雞還是先有雞蛋? Workshop : 2016.07.24 University of Colorado, USA. –系統論基礎工作坊：佛學的東方系統思維 – 以天人合一理解系統完整性 Systems Basics in Understanding System Wholeness “Reuniting Nature and Humanity”: The Oriental Systems Thinking in the teaching of Buddha. Abstract: A better way to explain the wholeness from an oriental point of view is the major direction of our research, but in the end it seems to coincide with modern Western systems thinking such as Relational-theory and DSRP systems thinking, as well as physics and mathematics. The first step starts from the concentration on the parts as in Reductionistic thinking, to the concentration on wholeness as in Systems thinking. Both schools of thought are important in their corresponding applications. The second step involves the combination of the observer and decision maker into the system, similar to the five aggregates human mind system in the teaching of Buddha, and the Relational-Theory by John Kineman. But finally the structure of the environment also need to be included for the sack of wholeness, similar to Schema theory by Kent Palmer. Now all three are coming together and forming the much better wholeness. 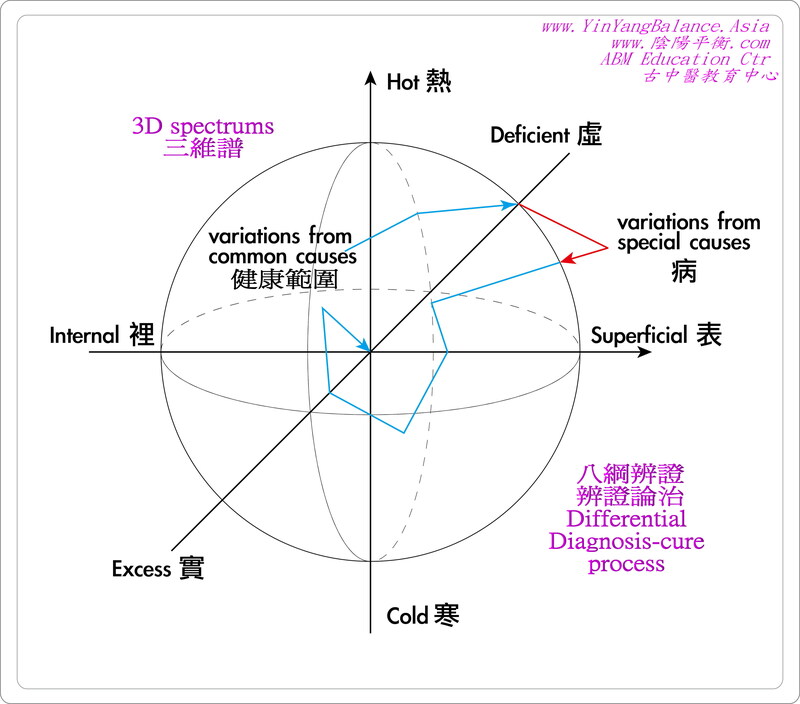 However, this is only the structure and properties of the wholeness, and there is also the diagnostic and regulative part from Traditional Chinese Medicine, which could be the application part of systems theory in real life problem solving. Together they are very promising in forming the wholeness of systems theory and systems practice. The structures and functions of human body in Traditional Chinese Medicine is based on the oriental system thinking of Taichi Yin-Yang structures and functions. Researches show that similar structures and functions are found in modern Western systems theories which are composed of systems, observers and decision makers, and the environment. TCM employs different systemic models to diagnose the human body. However, all these models employ the common 3D structure of Superficial-Internal, Cold-Hot, and Deficient-Excess spectrums. 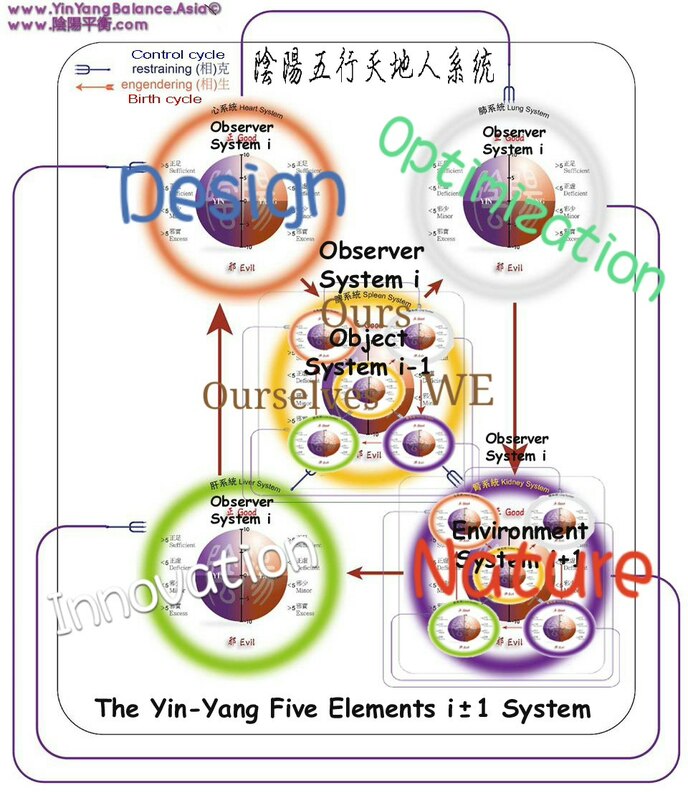 This oriental systems thinking seems promising in combining with modern Western systems theory in the application of system diagnosis and re-balancing. It is hoped that the combination of the east-west systems thinking will finally help human understanding in solving the modern complex problems. Chinese writing, English writing, Middle East writing emerging from different directions will in the end all occupy the whole paper to express the intended ideas, emotion, systems, instructions, and knowledge. Different systemic models arise together with their corresponding observers and decision makers. That is, people located with different geometrical properties, from Southern or Northern part of china. In addition, people with different properties because of the different state of their civilization, either at war or peace, lack of or over-supply of food, too much leisure or too much hard work. That is to say, the systemic model is also related to the environment, combined and emerged into the perspectives part, the water sub-system, of the whole system. Reductionism was the major scientific view before world war II, its development leads to industrial revolution and modern medicine. Traditional medicine like Traditional Chinese Medicine, Ayurvedic Medicine, Homeopathy, Naturopathy, and Western Herbal Medicine was then considered as alternative medicine because they are seem incompatible with reductionism and allopathic medicine. However, reductionism was found to be a incomplete scientific view after world war II and a more holistic scientific view was developed namely system theory.Systemic thinking is to consider both the system and the environment when analyzing or maintaining a system, or its environment. When analyzing a particular component within a system, all other components should be considered as well. Traditional medicine has been analyzed with the incomplete scientific theory for logical explanations about its medical theory and practice, resulting in confusion and misunderstanding. Papers or discussions which will demonstrate the application of system theory to investigate the holistic nature of any kind of traditional or alternative medicine are welcome for us to better understood medicine. Modern medicine was developed through reductionism. Papers or discussions which will demonstrate the applications of system theory to investigate the holistic nature of any part of modern medicine are welcome. This may involve any medical or healthcare problems, departments, programs, organizations or personnels.